Production: Cineguild; black and white, 35mm; running time: 85 minutes; length 7750 feet. Released 1945 by General Film Distributors, London, and in 1946 by Prestige Pictures. Re-released 1948 by ABFD, London. Filmed in England. Producer: Noël Coward; screenplay: Noël Coward, David Lean, and Anthony Havelock-Allan, from the one-act play Still Life by Noël Coward; photography: Robert Krasker; editor: Jack Harris; sound: Stanley Lambourne and Desmond Dew; sound editor: Harry Miller; production design: L. F. Williams; music: from the 2nd Piano Concerto of Rachmaninoff. Cast: Celia Johnson ( Laura Jesson ); Trevor Howard ( Dr. Alec Harvey ); Cyril Raymond ( Fred Jesson ); Joyce Carey ( Myrtle Bagot ); Stanley Holloway ( Albert Godby ); Everly Gregg ( Dolly Messiter ). Awards: New York Film Critics' Award, Best Actress (Johnson), 1946. Coward, Noël, David Lean, and Anthony Havelock-Allan, Brief Encounter , in Three British Screenplays , edited by Roger Manvell, London, 1950; also included in Masterworks of the British Cinema , London, 1974. Gaupp, Charles John, Jr., A Comparative Study of the Changes of 15 Stage Plays , Doctoral Study, University of Iowa, 1950. Levin, Milton, Noël Coward , New York, 1968. Morley, Sheridan, A Talent to Amuse: A Biography of Noël Coward , New York, 1969. Silver, Alain, and James Ursini, David Lean and His Films , London, 1974. Castelli, Louis P., and Caryn Lynn Cleeland, David Lean: A Guide to References and Resources , Boston, 1980. Lahr, John, Coward the Playwright , London, 1982. Dyer, Richard, Brief Encounter , London, 1993. Variety (New York), 28 November 1945. Lean, David, Penguin Film Review (London), no. 4, 1947. Lejeune, C. A., "The Up and Coming Team of Lean and Neame," in New York Times , 15 June 1947. "David Lean," in Current Biography Yearbook , New York, 1953. Conrad, Derek, "Living Down a Classic," in Films and Filming (London), May 1958. Whitehall, Richard, "Gallery of Great Artists: Trevor Howard," in Films and Filming (London), February 1961. Burles, Kenneth T., in Magill's Survey of Cinema 1 , Englewood Cliffs, New Jersey, 1980. Aspinall, Sue, "Women, Realism, and Reality in British Films 1943–53," in British Cinema History , edited by James Curran and Vincent Porter, London, 1983. Medhurst, A., "That Special Thrill: Brief Encounter , Homosexuality and Authorship," in Screen (Oxford), no. 2, Summer, 1991. Howard, T., "Brief Encounter," Reid's Film Index (New South Wales), no. 16, 1995. In 1929 Leon Moussinac could, in his Panoramique du cinéma , declare "L'Angleterre n'a jamais produit un vrai film anglais." The remarkable renaissance of the British film at the end of World War II requires a very different judgement. 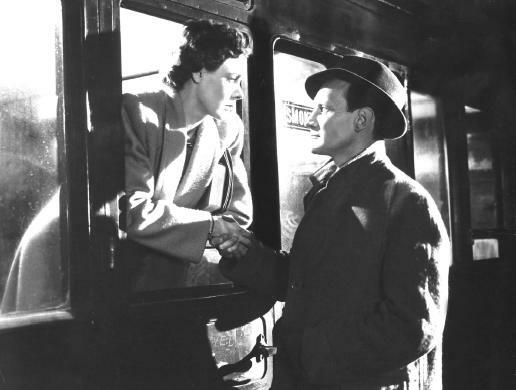 In 1944, David Lean made Brief Encounter , the most characteristic and perfect British film of all time. Its debt to Noël Coward must not be underestimated, but it is Lean's film. Lean, having worked as an editor on films by Michael Powell and Anthony Asquith, began his career as a director in association with Coward on In Which We Serve , This Happy Breed , and Blithe Spirit. He then directed Brief Encounter , about the infatuation between a housewife and a married man, with such uncanny human awareness and real creative skill that it stands out against his later more ambitious and elaborate films. Brief Encounter is on a small scale, intimate, and probing. Everything is obvious and yet nothing is. Laura Jesson, its suburban heroine, may not reach the dramatic solution of an Anna Karenina but what she does experience is no less poignant. We share her joys and sorrows of the moment until they carry her to the edge of tragedy. It cannot be seen entirely, however, as tragedy for there is an element of values and choice. Life is not simple and the greatness of the film lies in its awareness of this complexity. An insensitive critic once described the film as, "Two characters in search of a bed." French critics failed to see that there was a problem. But for characters like Laura and Alex, there were values that they honoured, even at the expense of pain. It is, in a way, a triumph for their common humanity. Very simply the end did not justify the means. The happy unification of this tale of star-crossed lovers, the intense reality of their attraction and the universal nature of the experience is played against a background that is deeply and truly British. If being British is the spirit of the "stiff upper lip," then it is belied by the passionate note that runs through the film. The small joys of love, the impetus towards realization and fulfillment, the sense of threatened pleasures haunts the viewer from beginning to end. The perfect performances of that most subtle of all actresses, Celia Johnson, and of Trevor Howard contribute greatly to the success of the film. It is, though, the happy fusion of all the elements that give it a perspective and unity rare in the cinema. The setting of the suburban railway station and its vicinity sees a great human drama take place. Everything about it is authentic down to the familiars who haunt it, the funny little people with their airs and graces and their trivial jokes and quarrels. Other dramatic incidents which occur in the film include the visit to the restuarant and the cinema; the humiliation and shame when reality shatters the dream; and the unexpected friend who turns up to interrupt their one possible night together. The film thus opens with the climax which is not fully understood until the gentle pain-filled voice of Laura relives the happy but poignant days of a moment of life she will never forget. There is one element that enhances the film in a most felicitous way. When Rachmaninoff wrote his 2nd Piano Concerto he could little have guessed that he was providing the theme music for a very beautiful and inspiring British film. Though it was not a commercial success in America, it was successful for the British cinema in terms of prestige.